The Helena-Fork Fire started on August 30, 2017, at approximately 5:00 p.m. near Highway 299 in Helena. 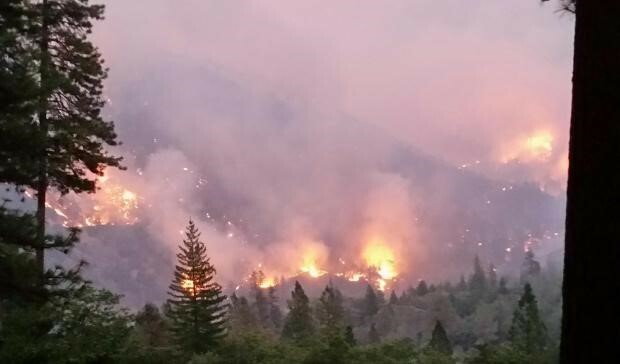 The fire burned to the northeast and southwest, into the Shasta-Trinity National Forest and private property in Junction City. The fire blazed for 58 days and was not extinguished until November 15, 2017. Tragically, during the nearly 2-month burn, the fire consumed 21,846 acres of land, destroyed 72 homes and demolished 61 additional structures. The scope of the fire and its damage can be seen in the images from the InciWeb website below. Posted to InciWeb on: 09/06/17 11:51 pm. 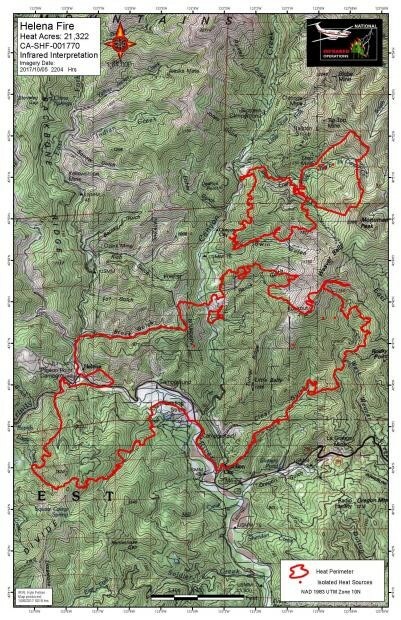 Additionally, the fire’s breadth can be seen by an infrared interpretation of the fire created by U.S. Forest Service, shown below in figure 3. Point of Origin. The suspected point of origin is near Highway 299 and Cemetery Road in Helena, CA. Cause of Fire and Responsibility of Trinity Public Utilities District. The Federal Bureau of Land Management and U.S. Forest Service have conducted an investigation of the Helena fire and concluded that it was caused by a Trinity Public Utilities District (TPUD) power line contacting, and then igniting, a tree branch. State law requires that utilities prune or remove vegetation that could damage or fall onto power lines. Therefore, the care and standards by which TPUD maintained their utility poles are at the center of determining liability and recovering damages. The report by the Federal Bureau of Land Management and U.S. Forest Service noted that with good professional judgment and a systematic approach a utility company may reduce the risk of injury to people and damage to property. Unfortunately, it appears that TPUD neither exercised good professional judgment nor applied a systematic approach to its maintenance procedures. Vegetation near TPUD’s power lines looks as though it was overgrown and unmaintained, creating a dangerous condition. Further, investigators are currently analyzing the damaged conductors, tree branch and a section of the pole. A notable discovery is that the utility pole lacks a TPUD serial number on it, which raises questions as to how frequently TPUD performed maintenance and inspections, if ever. Based on the report from the Federal Bureau of Land Management and U.S. Forest Service, the likely conclusion is that the fire was caused by TPUD’s poor maintenance and inspection practices, which led to a “phase to phase fault”—the travel of a high voltage charge from one conductor to another that ignited untrimmed branches and shrubbery. It is recommended that all neighboring homeowners, if appropriate, speak to a qualified professional to determine any health-safety and environmental risks, including flooding, landslides and rock fall, that may now exist because of the fire.